Dale is one radical dude! Just fresh into adulthood and he's out there to prove to his old man he isn't going to sit back and rot away like him. His father urges him to take over the family business of roofing and window installation, but Dale isn't about that bogus life. In a bold and rash decision, he has decided to join the SDT to show everyone what him and his skateboard are capable of! 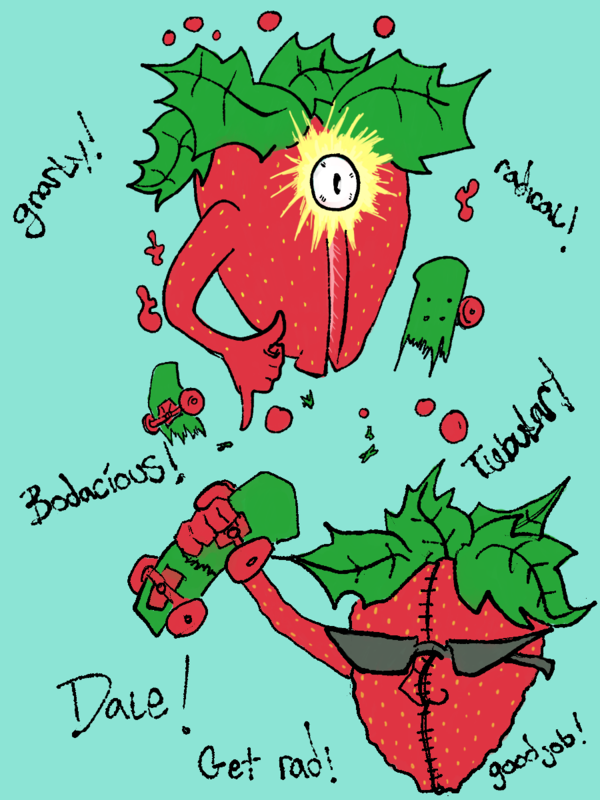 WOAH BODACIOUS! *Important Characteristics* Dale only has one arm for radical gestures. He has a nose, no mouth. Dale is a pro skateboarder, but his father doesn't approve of his lifestyle. Dale can kick flip a 20 stair. UPDATE : Dale had an affair with Gumshoe. Dale smoked the genie. Dale may of died and ascended to become the god of radicalness. Dale's board broke in half and in which he also broke in half. Dale's boards name is "Deck Tracy"